TPT Pumps are ideal for laboratory, processing, pH control, nutrient dosing, environmental sampling functions, R&D, aggressive fluids, and OEM applications. Aalborg’s TPT, TPU and TPV model peristaltic pumps are designed for safety and long tubing life. They are economical,easy to load, sturdy, and compact for a small footprint. Designed for use with liquids of widely diverse viscosities,they are suitable for laboratory, processing, and OEM applications, including fuel with the appropriate tubing. Flexible tubing, which conveys fluid from source to destination, is squeezed inside the pump head by rotating rollersagainst a rigid, crescent-shaped Occlusion Wall. The rollers induce suction in a pulsing rhythm. TPT and TPU modelsoffer adjustable occlusion for increased pressure, or decreased pressure to extend tubing life. TPU and TPV pumps are comprised of front panels with controls, pump heads, motors, rigid cases with rubber feet andhandles. The moveable handles are practical for carrying the pump, lifting and angling the pump face plate, and makingthe controls more user accessible. 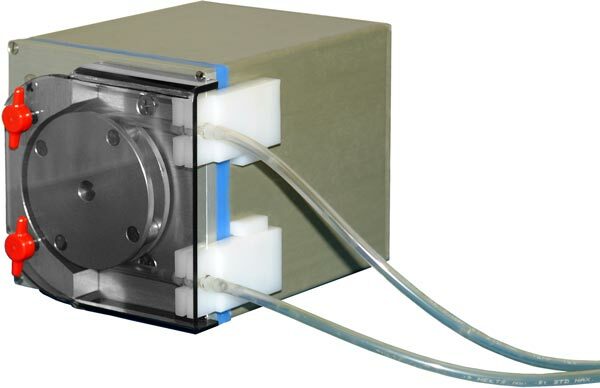 Economical Model TPT Mini Peristaltic Pumps are designed for liquids. Simple to load and operate, two plastic thumbscrewsallow easy Occlusion Wall adjustments, provide longer tubing life, and secure the safety shield. Two plasticslide on/off tube holders assure quick tubing replacements. User-selectable flow rates from 1.90 mL/min. to 28 mL/min. are dependent on the tubing material and ID; 1/32" walltubing is required. TPT Pumps are CE compliant.